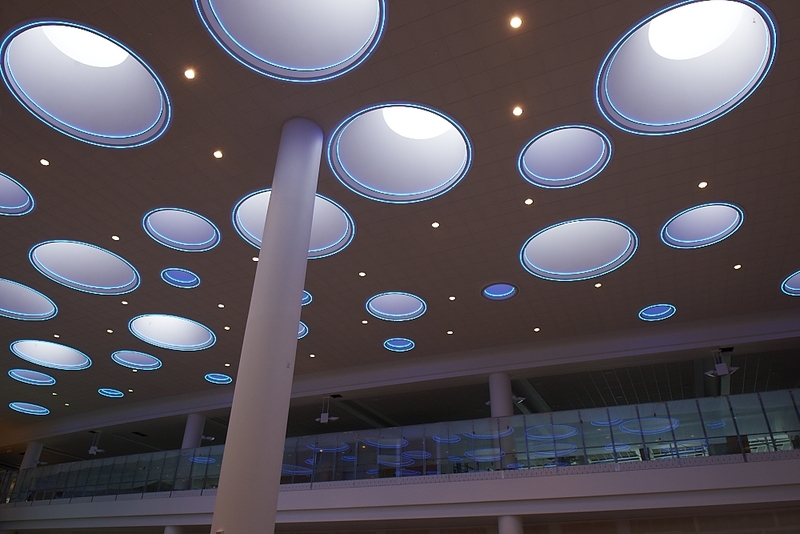 I love to travel, and frequently travel through the terminal at Winnipeg’s James Armstrong Richardson International Airport. What a joy it was, when on October 30th, a new state-of-the-art terminal was finally opened to the public after more than four years in the making. 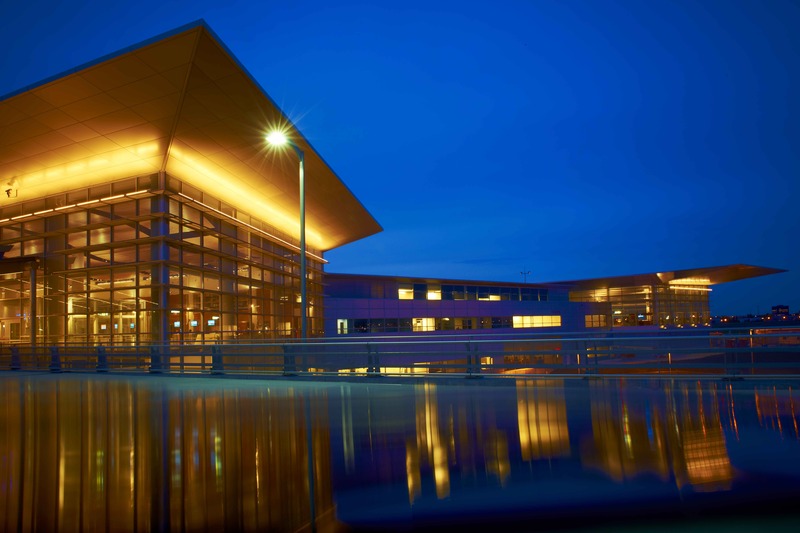 A joint effort of US-based Master architect, Pelli Clarke Pelli, who have also been responsible for various world class designs including the Petronas Twin Towers in Kuala Lumpur and the World Financial Center in New York, and our own local architectural firm of Stantec, Winnipeg’s new terminal is proudly the newest and greenest of all airports in Canada. A nice high for Winnipeg to enjoy. Combined with the recent return of the Winnipeg Jets pro hockey team, and the fact that the Winnipeg Blue Bombers won the Eastern final in the Canadian Football League game today — getting them into the Grey Cup championship game next weekend — the Manitoba capital is really enjoying a much-needed resurgence. Many of you reading this may have never been to Winnipeg and are likely wondering, why visit this frozen wasteland? It’s true. We have winter for five months of the year (generally from early November through March) during which we time we have snow and below freezing temperatures. But I must tell you, Winnipeg is a warm place to come at any time of the year. People are caring and friendly. They welcome you into their lives and their homes. I have friends who have lived in larger cities for many years and have yet to make any close friends. That just doesn’t happen in Manitoba. If you’re here and you’re friendly … you’re family, and are welcome into our homes and to share our hopes and dreams. Can those of you living in larger centres say that? I was born and raised in Winnipeg, and have lived all of my life within an hour’s drive of the city. We have our problems with respect to crime and that’s part of the reason I have chosen to live in smaller communities in rural Manitoba the past (near) 30 years. But overall, it is a clean, inviting urban landscape that offers unsurpassed cultural options, a thriving creative community, affordable cost of living and stable economy that makes all of us who know it, love it. Please come and see us. If you come before April 1st, bring your parka and boots. Be rest assured, the warmth we extend your way will nurture your spirit and make you wonder why it took you so long to finally make the journey. But our long stretch of winter weather does make me wonder why they didn’t enclose the walkway from the parkade to the terminal. No matter how warm you are inside, the blowing winds outside can quickly chill your enthusiasm. Please join us back here the week of December 5th, when I’ll share a bit of Missouri magic with you. Until then, please share your favourite Manitoba moments with us. 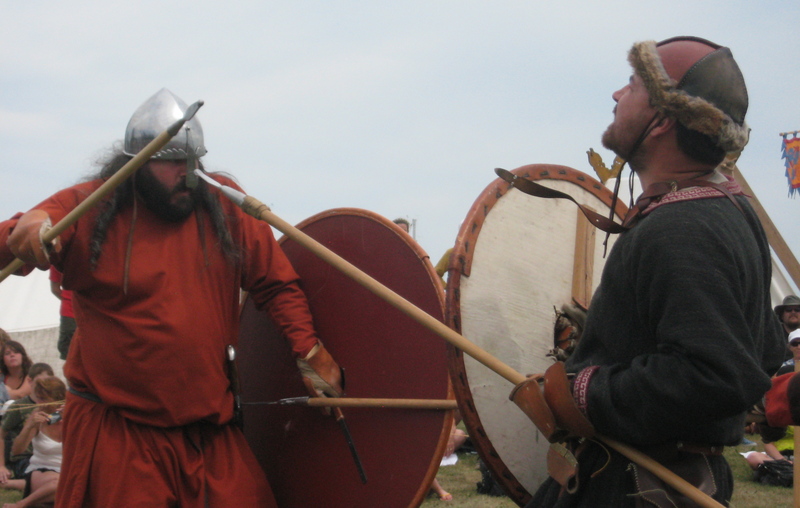 We visited the Icelandic Festival in Gimli on the weekend and were fortunate to have timed our visit to see the battle re-enactment performed by members of Vikings Vinland, a troop of re-enactors from all over North America. It was awesome! We also enjoyed a Goldeyes baseball game in Winnipeg. But what really inspired me to write this post was the amazing culinary talent we have right here in the Interlake. Yesterday, I had the pleasure of attending High Tea at the Fat Cat Bistro (located just north of Camp Morton on Hwy 222.) It’s held every Tuesday from 2-4 pm and is a delight for just $13. We started with a plate of giant pinwheel sandwiches, followed by a course of hot appetizers. I loved the giant Japanese mussels made in a sauce of tomatoes and peppers. The mushroom puffs were also terrific and light. And a crostini featuring local Goldeye fish finished off the middle course with a lovely fresh flavour. The dessert course consisted of a plate of cheeses and fresh fruits alongside a plate of dainties. And yes, there was chocolate! The chocolate coconut brownies were soft, chewy and really quite decadent. Although the High Tea was not traditional in the sense that there were no scones with clotted cream, it was delightful in every way. I’m told by Chef Karen that she does make scones on occasion and changes the menu every week to keep her scores of regular customers happy and coming back each week or every second week to see what she has in store. Today, we visited Fat Cat for breakfast. I’d been there once previously for dinner, but had not (until today) had the pleasure of enjoying one of their tasty breakfasts. As I’m watching my calorie count these days (the two years of intense chocolate tasting has finally caught up with me!) I ordered a simple breakfast of two poached eggs and sausages with multi-grain toast and sliced tomatoes. Include your coffee or tea and you’ve got an amazing breakfast for $5! My male companions were not as concerned with their waistlines and ordered much more elaborately. Roy had the omelette, asking Chef Karen to create something unique for him. And that she did! 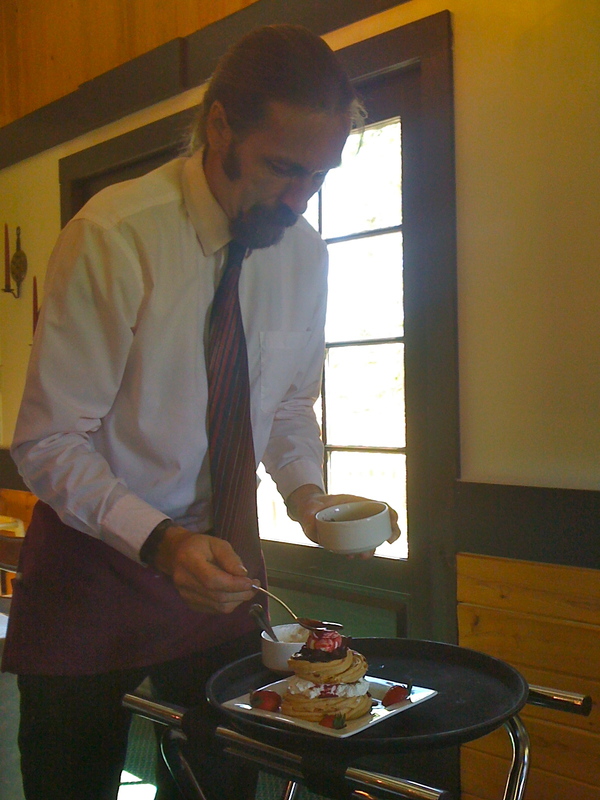 His fluffy omelette was stuffed with goat’s cheese and local Saskatoon berries. A bit heavy for me, but Roy loved it! 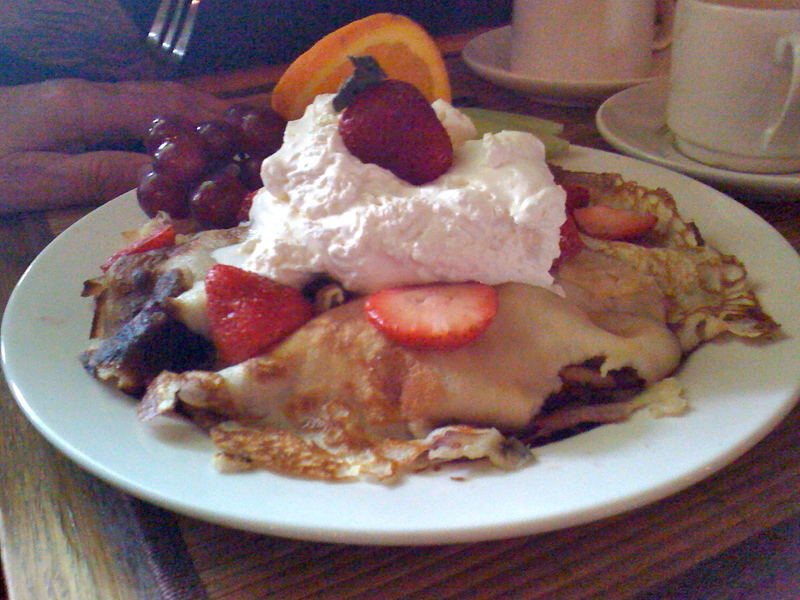 My husband, Reg, ordered the authentic Icelandic pancakes (Karen is a local girl of Icelandic heritage) stuffed with seasonal berries and topped with fresh whipping cream. Wow! That was truly amazing, and something that I would order on a return visit. Fat Cat Bistro is becoming a local favourite with discerning diners of the Interlake. That, along with Mask Mediterranean Restaurant of Gimli are boasting internationally trained chefs who love the Interlake region and are hoping to tantalize diners’ taste buds beyond the (pickerel) fish and chips (french fries) that have become the flagship meal of many area restaurants. Let’s talk. Tell me about your favourite hangout, event or memory from YOUR most coveted Manitoba time. Please note there will be a special “Blog Jog Day” post on this blog on Sunday, August 7th, as I once again participate in an event that helps fellow bloggers expand their audiences. And we’ll be back the week of August 15th, when we will finally explore the virtues — and chocolate — of Montreal. This blog usually takes us to exotic locales in search of chocolate and other delectables. But this post, I’d like to salute my own home turf in honour of Manitoba Day. I was born and raised here. It is my home, and I’m proud of its many attributes. Last summer my husband and I toured our area, taking in many exciting festivals and events. I wrote about them on my lifestyle blog but will recap the highlights here for those of you who may be curious about what there is to do in Manitoba’s Interlake region. 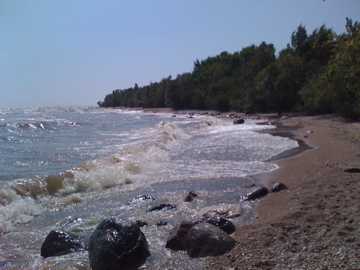 In the Aug 23/10 post, I took you to Camp Morton, a stunning beach on Lake Winnipeg just north of Gimli. This beautiful picture of the beach inspires me on days (like today) when my energy level is on the low side and the air pressure is correspondingly low because of the dreadful weather we’ve been having this month. I know it will soon pass and we’ll once again be strolling along the shores of Lake Winnipeg talking to the shore birds and feeling the misted breeze on our faces. 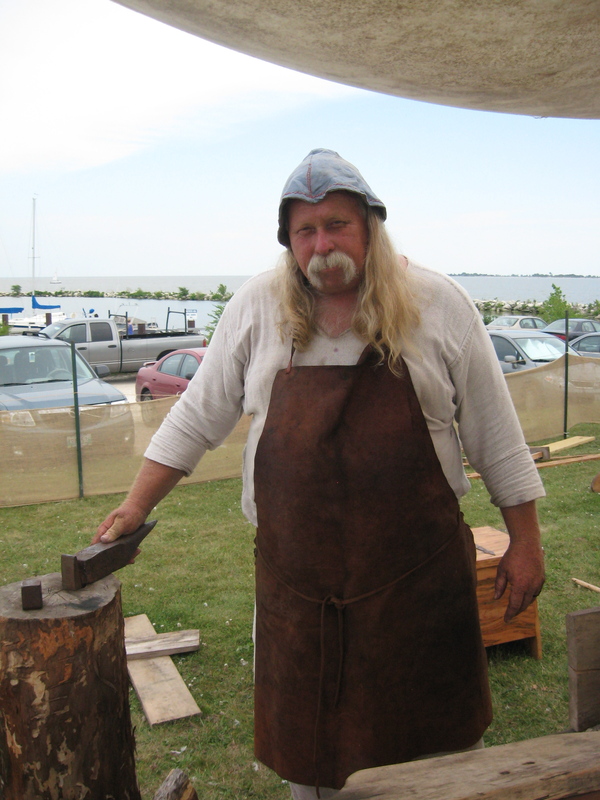 In the Aug 9/10 post, I introduced you to the re-enactors who live like Vikings for the first week of August each year as part of Gimli’s Icelandic Festival. Who wouldn’t be smitten by a smile from this face? 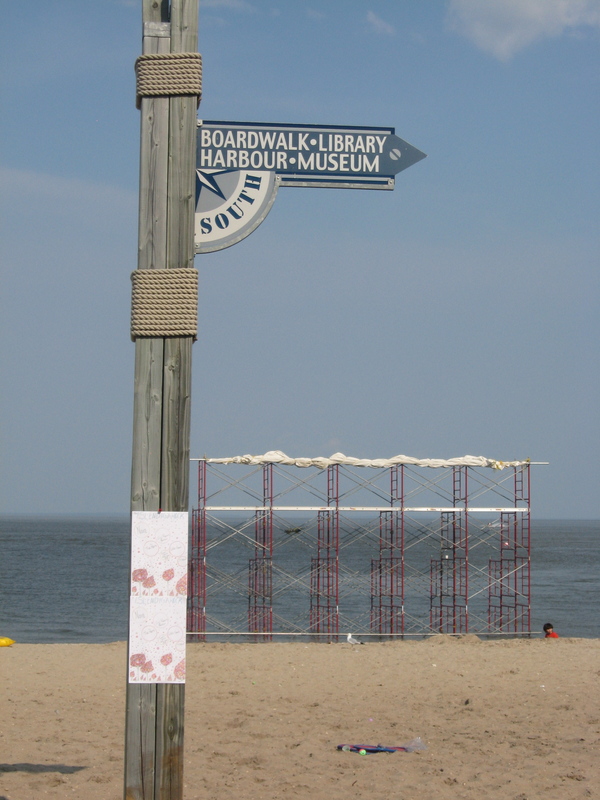 In the July 22/10 post, we visited Hecla Island and the Gimli Film Festival. Hecla is a terrific place to explore nature, and although the Hecla Oasis Resort has come into financial difficulties and suspended operations, the campground and golf course are open for your pleasure. And be sure to mark your calendars and take in the Gimli Film Fest which runs July 20-24 this year. In the March 29/10 post, we visited Chatfield, Manitoba, a rather out-of-the-way community in Manitoba’s Interlake region that surprisingly came up in conversation at a function I attended this week. Out of 4 people in the discussion, 2 had a connection with Chatfield! They certainly have a terrific museum for anyone interested in country memorabilia. And with Winnipeg being my hometown, we can’t talk about Manitoba without tipping our hats to the province’s capital city. Check out my Feb 27/09 post to see some of my favourite things about Winnipeg. A shocking survey by Peak of the Market suggested that most Manitobans don’t even know that May 12th is Manitoba Day. I hope this post will help change that, and that many of us will plan to discover or revisit some special places in this province over the summer to remind us just how lucky we are to live here – despite the challenges of the crazy spring weather. My heart goes out to our fellow Manitobans in the Westman region who are facing a breach of the dike today. A crisis which do doubt has literally put a damper on any celebrations in the western part of the province. But we look forward with hope. Please share your thoughts on a Manitoba gem you enjoy, or what you like best about Manitoba. Look for the next post here during the week of May 23rd, when I’ll be preparing for a trip to Toronto. And yes, there will be chocolate.